While everyone has different preferences about how they like to get around, there is one thing we all have in common: at one point or another we are all a pedestrian. And while there have been increased safety measures to make the roads safer for drivers, recent studies show pedestrian deaths are still on the rise. In its annual “Spotlight on Highway Safety Report”, the Governors Highway Safety Association conducted a study that compared pedestrian deaths from the first six months of 2015 with previous years. The results were shocking. Pedestrian deaths are up 10% from 2014. For the first time in 25 years, pedestrian deaths accounted for 15 percent of all traffic accidents. 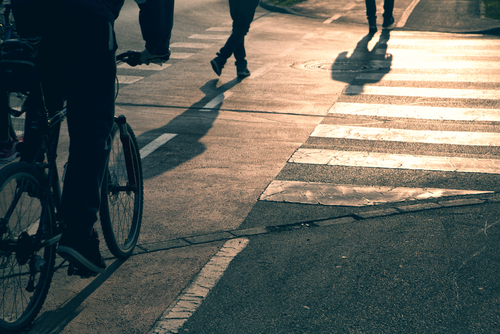 Twenty-one states had a decrease in pedestrian fatalities. Just four states accounted for 42% of all pedestrian deaths: Florida, Texas, New York, and California. When population is taken into account the states with the highest mortality rates were New Mexico, Florida, Delaware, Louisiana, South Carolina, and Arizona. The reason for more pedestrian deaths, the report says, has to do with recent economic, social, and electronic trends. Cheaper gas means more people are driving. The amount of cars on the road increased 3.5% in the first half of 2015 compared with the previous year. The recent rebirth of “walkable communities” has led to nearly a million more people choosing to walk or bike to work. The combination of more drivers and pedestrians is making the road a crowded place. More so than crowded roads, distracted commuting is causing accidents by both motor vehicles and pedestrians. While distracted driving is well known to be among the greatest dangers facing drivers today, the less talked about danger is distracted walking. The increased use of cell phones while walking is proving to be a significant source of distraction for pedestrians. By wearing headphones and being absorbed in their phones, pedestrians become unaware of their surroundings and put their lives in danger. But because drivers are inevitably going to be distracted at times, pedestrians should be extra vigilant of their surroundings. Even though pedestrian deaths have spiked, there have been efforts to increase pedestrian safety. Improved street lighting increases pedestrian visibility at night. Creating more underpasses and overpasses provides pedestrians with a necessary safety barrier in heavy/high traffic areas. But improving safety infrastructure takes time. As a pedestrian there are safety precautions you can take to increase your safety right away. Wear brightly colored clothes, especially at night so drivers are able to see you. When possible, always use a sidewalk and don’t stand too close to the road at intersections. Make sure to always look before you cross especially at street curbs. And of course, be aware of your surroundings and reduce the use of distractions such as cell phones and music. At Jim Dodson Law we advocate for pedestrian safety and we want you to be aware of the risks and responsibilities of being a pedestrian. We are strong advocates for holding drivers responsible when their carelessness or fault seriously injures or kills a pedestrian. If you or someone you know has been hurt in a collision, you need an advocate in your corner who understands pedestrian accidents. Just call us. We never charge to talk about your case. We are paid only if you win and only a percentage of your settlement.